Yet another secret deal made between the U.S. and Iran as part of the Iran Deal has been uncovered. On Thursday, the Wall Street Journal reported that the Obama Administration agreed to lifting U.N. imposed sanctions on two Iranian state banks on January 17, the same day that $400 million dollars cash was given in exchange for American soldiers. The U.N. Security Council’s delisting Bank Sepah and Bank Sepah International was part of a three part agreement that was finalized on that day. According to the WSJ, the two banks were originally blacklisted for financially supporting Iran’s ballistic-missile program but Tehran argued the banks are crucial to Iran’s economy and only hurt its international trade. Under the Iran Deal, the U.S. Treasury Department sanctions on the banks were set to be lifted on Jan. 16, but the U.N. sanctions were supposed to continue until 2023. The package of agreements signed on the morning of Jan. 17 altered that. U.S. State Department official Brett McGurk and a representative from the Iranian Government finalized and signed a three part document agreement package. One document required the U.S. to drop criminal charges against 21 Iranian nationals and also required Iran to release the imprisoned Americans. A second document required the U.S. send $400 million in cash and two subsequent payments equalling $1.3 billion that was interest accumulated on a failed arms deal between the two countries in the 70’s. The final document pertained to the delisting of the two Iranian State banks. 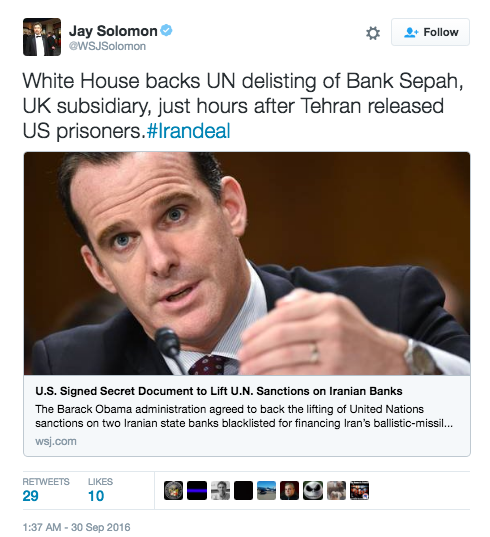 A tweet from Brett McGurk who signed the three part agreement with an Iranian official. U.S. officials also stated they believed the Islamic Republic of Iran deserved the sanctions to be lifted for holding up their end of the bargain and implementing terms agreed upon in the Iran nuclear deal. Since the signing of the Iran Deal, the Obama Administration has not been forthright with every component of the agreement between the United States and the Islamic Republic of Iran. While Obama and his aides refuse to call the cash exchange in return for Americans “ransom” they have confirmed the release of the hostages was contingent on the delivery of the cash.